At £10, the IM-me is a great device. Much work has been done to turn the handheld console into a general purpose device. I’ve been doing the same for the USB dongle. The dongle has two chips, a Chipcon CC1110 SoC radio (on the left) and a Cypress CY7C63803 USB microcontroller (on the right). 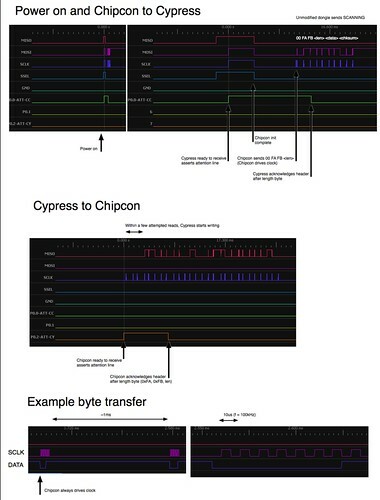 The CY7C63803 handles USB data transfers and communicates with the CC1110 over a SPI interface. Each chip drives an attention line, used to notify the other. This is raised to signal willingness to receive then lowered to acknowledge reception of a valid header. 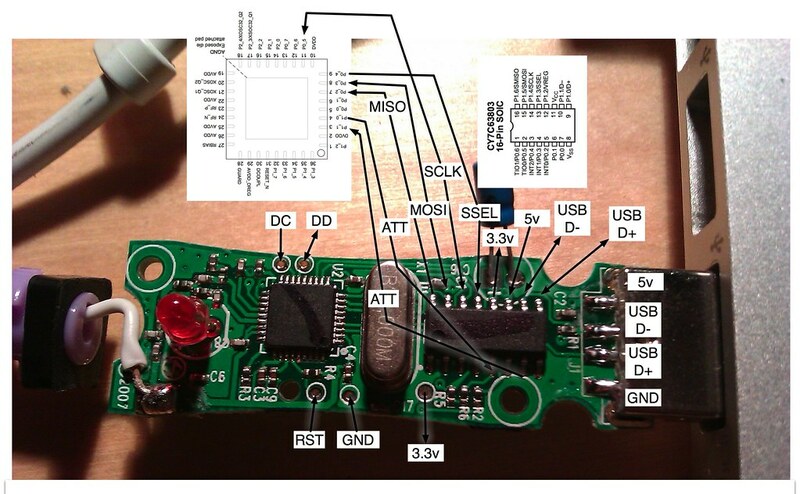 Reprogramming the CC1110 is straightforward enough, it can be done with a GoodFET and SDCC. But, the CY7C63803 is a black box - even if I could reflash it, I doubt I could make USB work again. So, I’ve built a custom CC1110 firmware which can communicate over USB to a PC via the unmodified CY7C63803. After some protocol investigation using an Open Logic Sniffer, I now have a working proof of concept. From a PC, commands can be sent to the dongle and responses received. So far, you can control the LED, read registers and transmit modulated carriers. 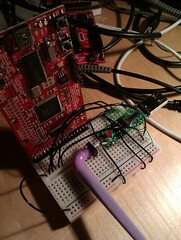 The dongle is controlled from a small interactive shell using libusb (based on the GPL drivers for the stock unit). There are bugs, but it works. Download the source for CC1110 and PC. If you find a use for this - let me know.